Ireland is one of my favorite places that I’ve never been but can’t wait to visit. It’s at the top of my bucket list, which is funny and amazing since this book is all about main character Amber Welles’s bucket list and her first time visiting this beautiful country. I knew a little about Amber from Burying Water, and I admit I wasn’t sure how much more I wanted to know about her. While I’m crazy about Amber’s brother Jesse, I didn’t think I would be able to relate to her. And I didn’t… at first. Some of Amber’s innermost thoughts rubbed me the wrong way, even though it was pretty easy to forgive her for having them because she really is a nice person – she’s just lived life in a bit of a bubble in her small town. I have to give the girl props, though – I find it so courageous that she would take this trip all alone, and that in itself began to soften me up towards Amber. See, Amber views the world and all its people much the way she believes her father does: in black and white. What we readers learned from book one is that Sheriff Gabe Welles discovered that there is a lot more gray area in life. And Amber’s journey is about to lead her to the same conclusion. I love the awakening that she has as well as the growth of character. So speaking of Jesse, I couldn’t imagine loving a character in this series as much as I loved him. And then River Delaney happened. From the moment he risked his life to save Amber, a complete stranger, he had my full attention; and the more I learned about him… the harder I fell. I adore his family – especially his youngest brother Rowen. And Ivy was such a treat! I also loved the visits with Sheriff Welles, and especially Alex and Jesse. It was like seeing old friends and in the same moment making new ones. But my absolute favorite aspect of this story is the history of Ireland. I was absolutely engrossed as I learned more about the IRA, the RIRA, the potato blight, and famine. Sorry, Mr. White, but if Ms. Tucker had been teaching me this stuff in school, I would have done a lot better than a B. ;) The stunning details and the beautiful stories within the story (Marion and Charles *sob*) are breathtaking. Amazing detail, intriguing secondary characters, vibrant descriptions, and so much incredible history have me recommending this book to all readers! 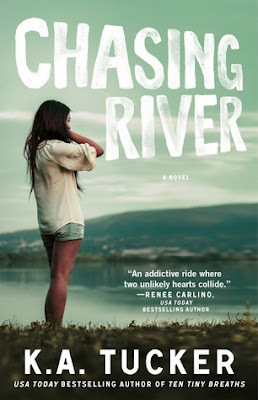 Chasing River just stole first place for me, and even though I only finished it last night… I can hardly wait to read it again. Oooh, adding this to my TBR! Ireland is on my bucket list, too; I'm hoping to go within the next two years. Thanks for a great review! this book Wifey.... THIS BOOK! Gahhh I could fangirl over it for days and you know what... I'm pretty sure that is going to happen so you best have your texting fingers ready for me and my crazy! I loved River so much and I am so glad we are on the same page! GAHHH just so much perfection. *skips around the room* Love you and love this review! I can really relate to this novel, because, in the past, when I really wanted a man, I kind of 'chased' him. Lol. Not that I was a player or anything, but I would a guy I liked a BIG hint that I liked him. And I would allow him to see how happy I was to see him when I happened to run into him......It didn't always work, of course. And it's not good to act too 'overeager' around a guy, either. It really get to their heads, right? About this book -- it sounds FANTASTIC!! I've always wanted to go to Ireland myself! It truly is a magical land. I feel the same way about England and Scotland. Those are three countries I've always loved! As for the characters, they do sound wonderful -- especially the guys. I love to read about yummy men! (What red-blooded female doesn't, right? Ha, ha! ) So River and Jesse are definitely men I want to 'meet' through this book and the previous one! This was by far my favorite of the series, although we get Ivy's story next.